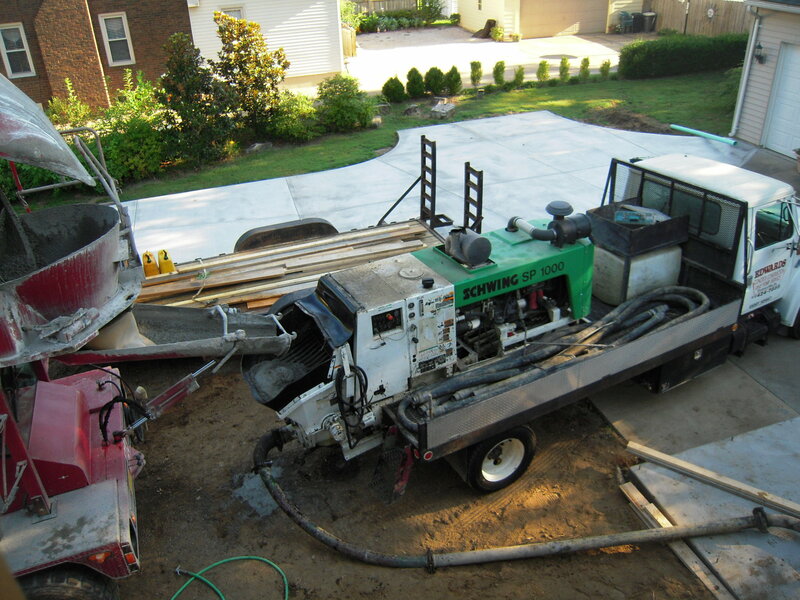 So where were we – oh it’s time to add a little more concrete to the house – can’t have enough concrete I say. 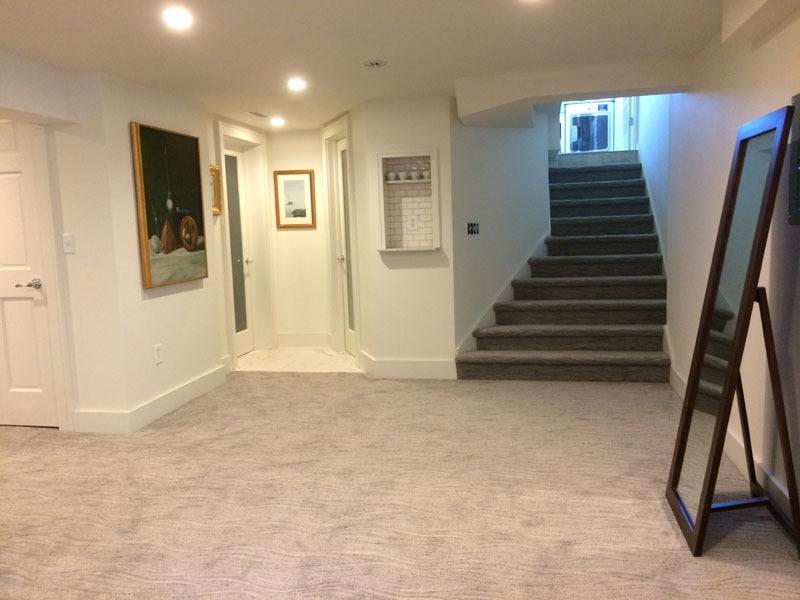 After doing a lot of research of various floor solutions I decided a new concrete overlay would work the best – mainly because of the steep slope and poor condition of the concrete. If the original floor was flatter and in better shape, I probably would have used a system like DRIcore. 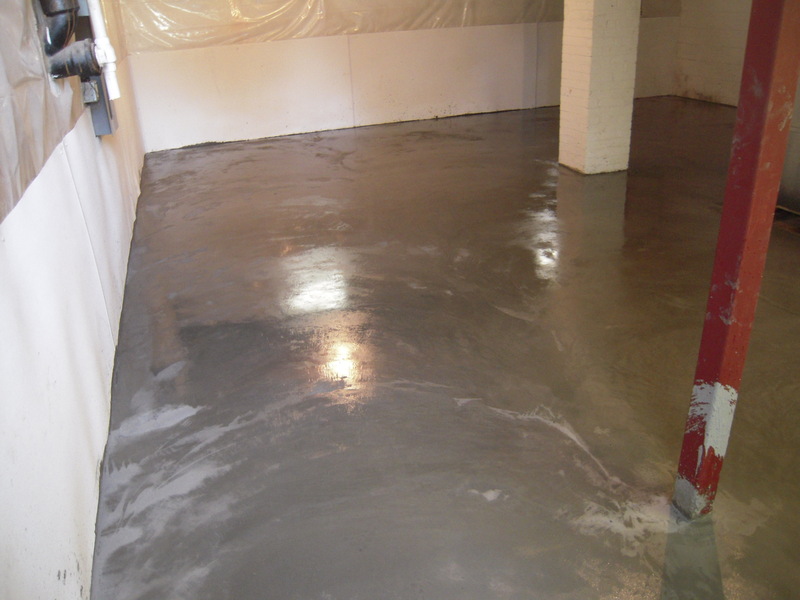 Now the concrete overlay should be at a minimum of 4″ thick – It’s also important to formulate the concrete so that it minimizes shrinkage and maximizes strength. The pour will be up to 7″ in some areas. Here is the corner with the full bath rough in. 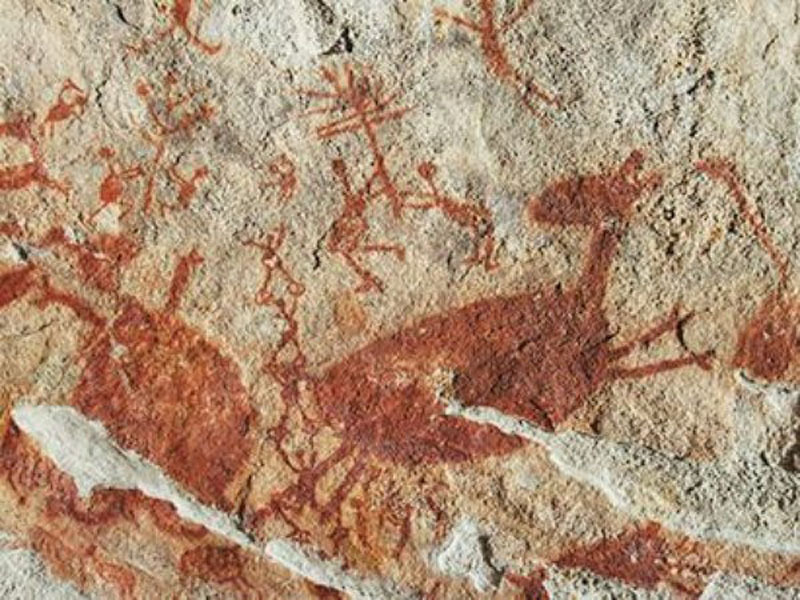 This will be covered up until it’s needed – if ever. Then you just break up the concrete and set your fixtures. The blue line is the target thickness. The trench is for the air conditioner condensate line drain. You do remember this is all a freestyle design exercise, don’t you? – you are about to witness another one of my efforts that will come back to be a waste of time and money. Here you see the forms around the HVAC units. I thought I would leave the HVAC here, perfectly good units – high efficiency. Oh, well – we’ll get to that in another post. Looking back you can see the stairs have been removed and a handy ladder takes it’s place. You can also see the steel support beam that has been installed with a proper 2′ footing underneath. This is the right location for supporting the upstairs bath. 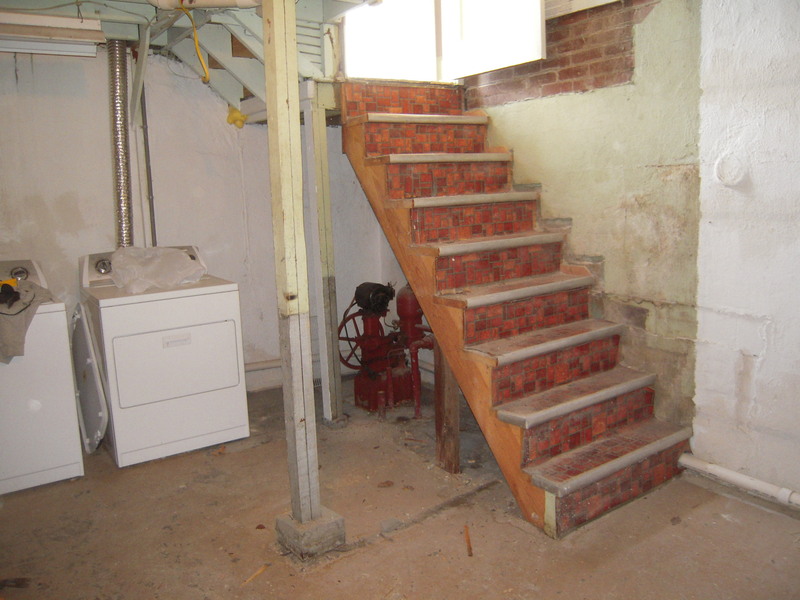 The wood post to the left holding up the stairs will be removed and a short wall will take it’s place at a later date. 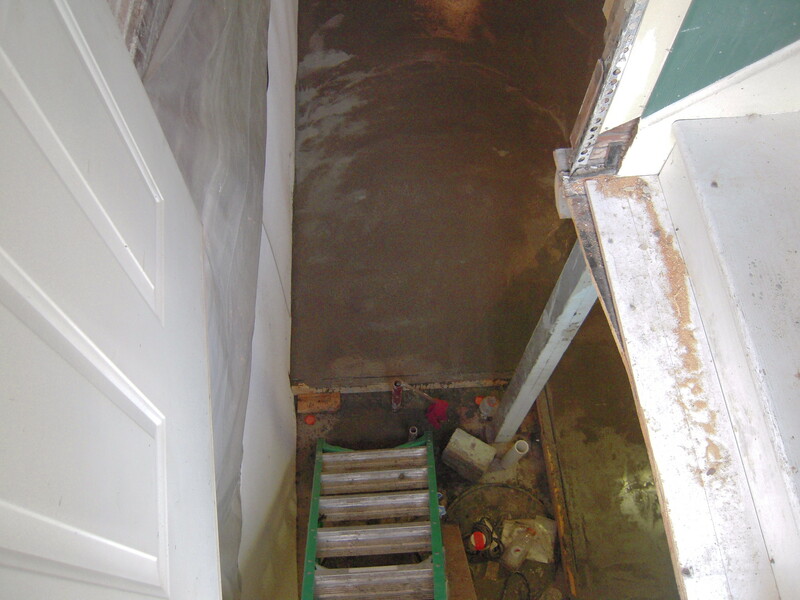 The floor has a severe slope to the drain – the new floor will fix this. 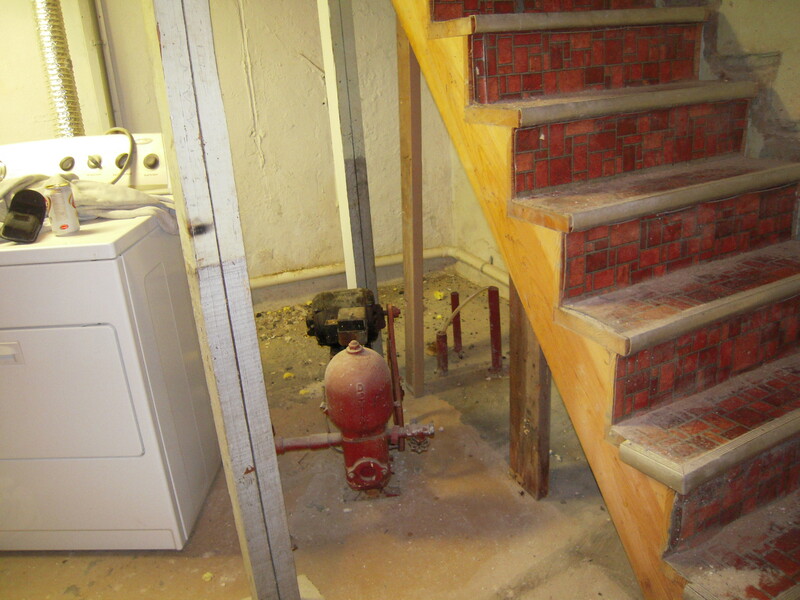 Also, there are forms around the water well so that a new pump will clear under the stairs. 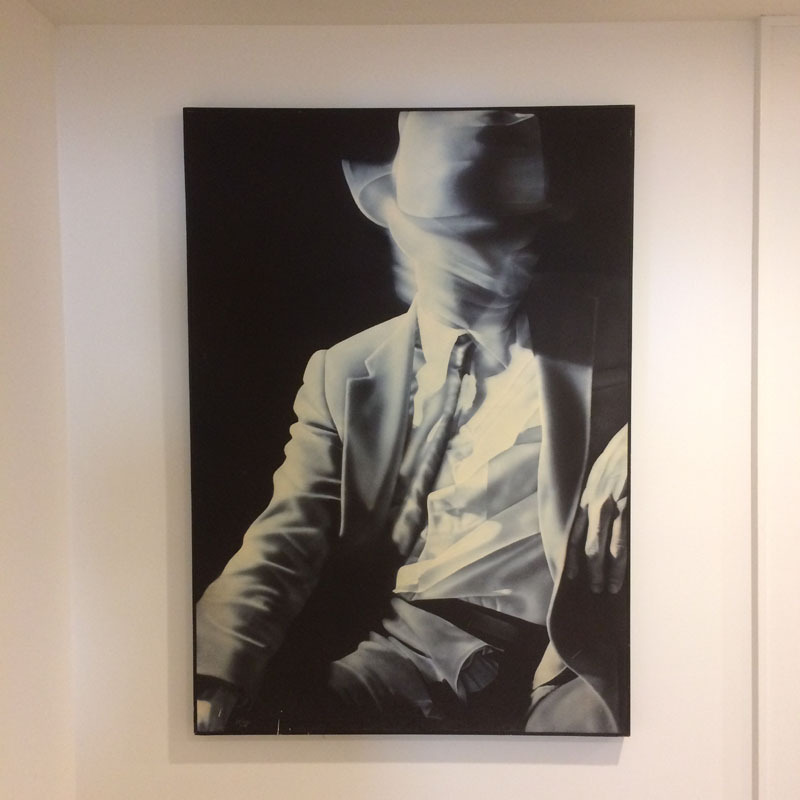 Nice and flat – this gives me almost 1000 sq. feet of living and work space down here in the two rooms. And around the air conditioning unit. 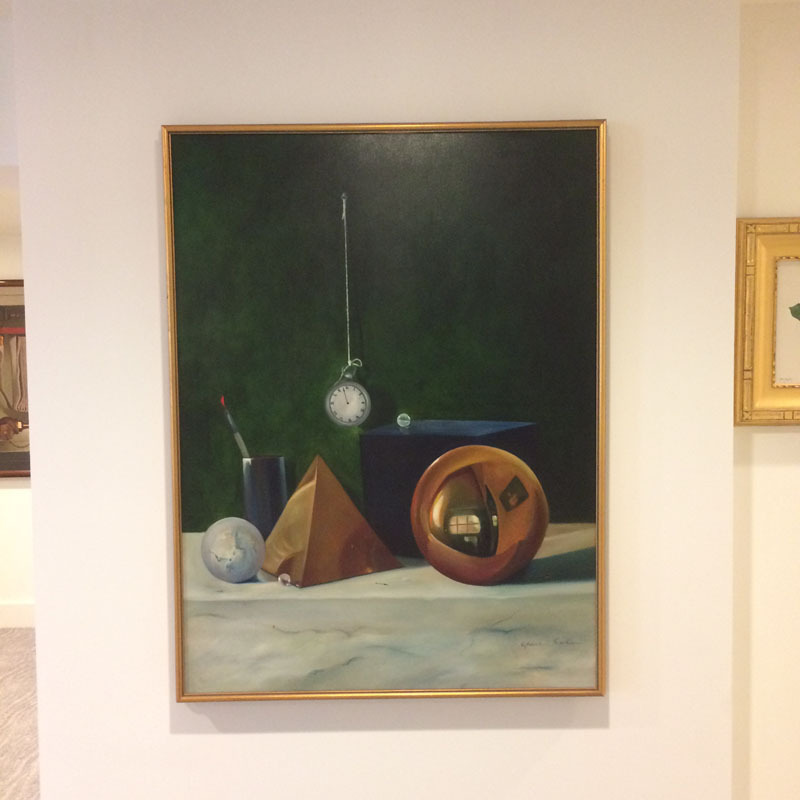 Even with the added floor thickness I have a ceiling height of 7′ 2″ – so I can live with that. And the stair area. 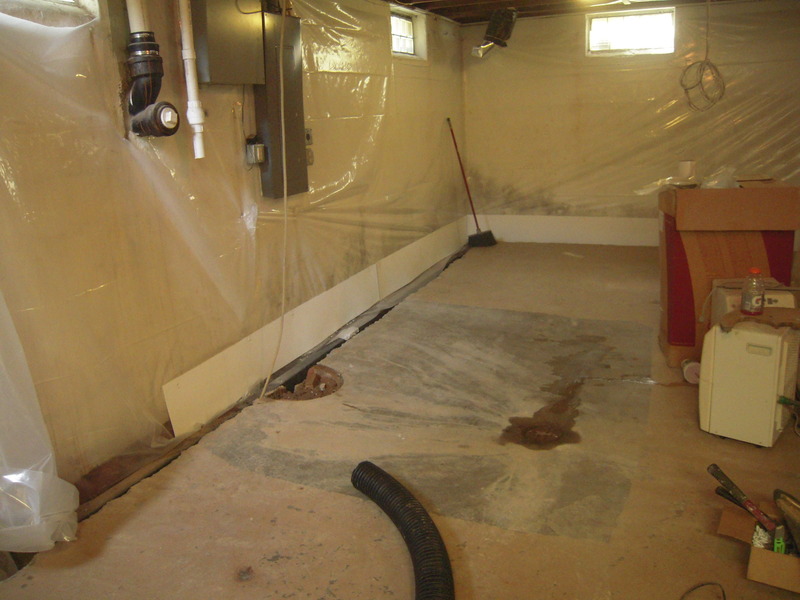 You can see the sump pump as well as the waste pump well locations. Also the water well is here as well. Gee, I noticed a lot of ‘wells’ in this last note. Well, now we have a nice flat floor. We won’t be doing much down here for awhile – I hear a couple other rooms calling me for attention. But we’ll be back to change some things – as you know freestyle design is exhilarating as well as frustrating – and ding-dang expensive. The thing is, I have no one to blame but myself. Next up well, tackle that new back entrance. 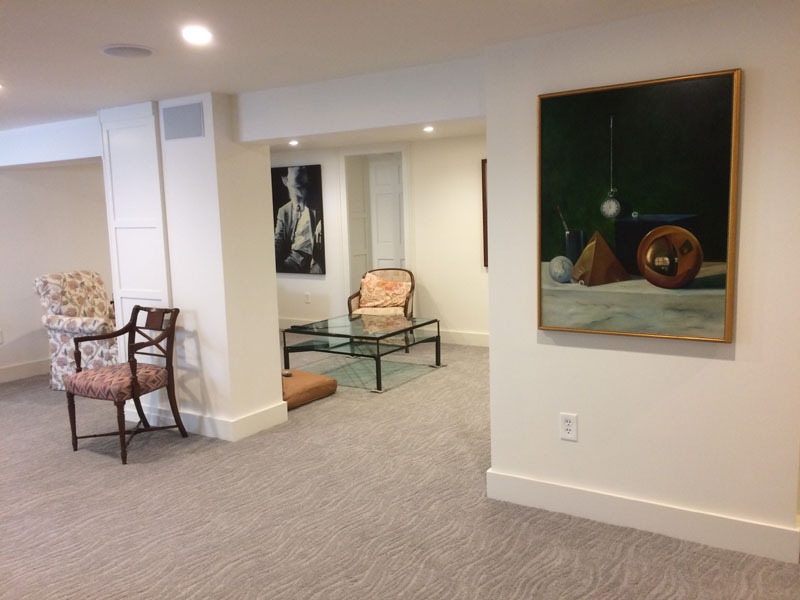 Here are a couple of shots of the basement. The paneling and old counters removed and exposing the staircase. You can see the old water well under the stairs. Also visible is the back door landing structure and the stairs that lead up to the kitchen. Those two double 2X4 posts perched on bricks are so wrong for good structure. 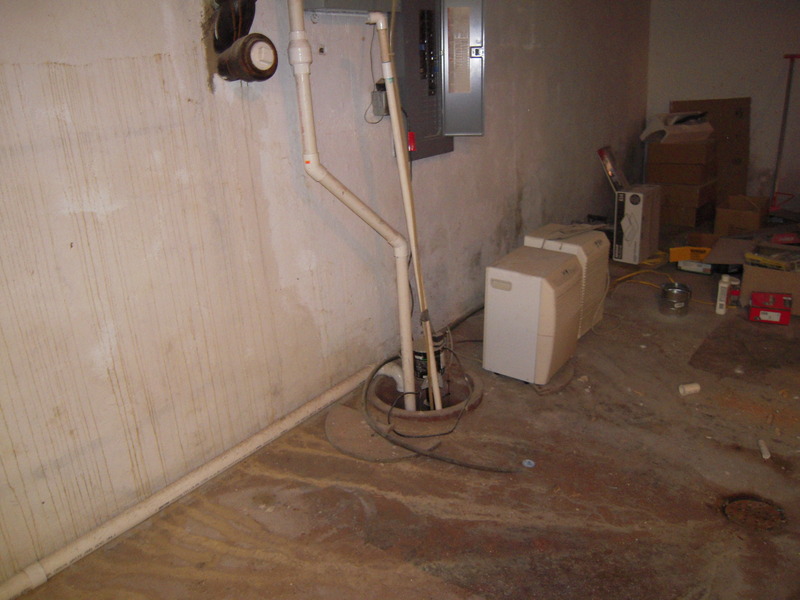 Here is the sump pump in a very inconvenient place. 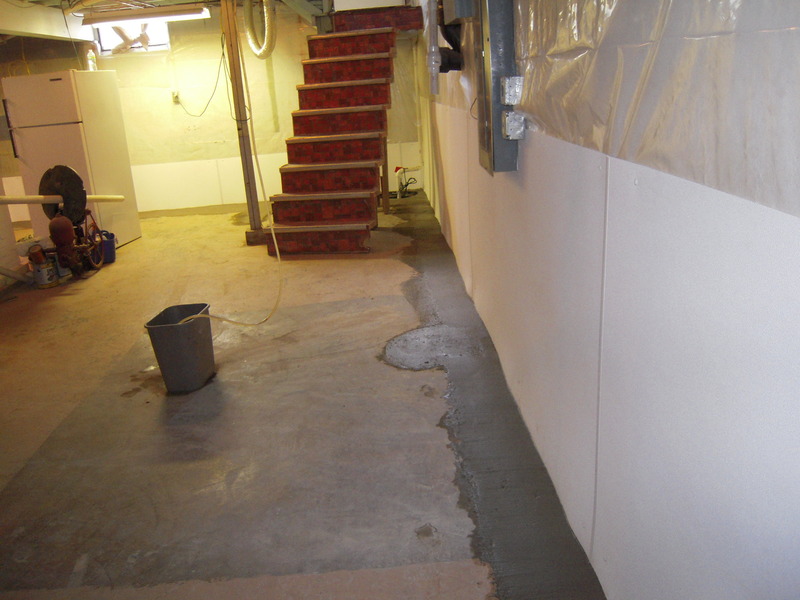 The slope of the basement floor was also an issue. It varied as much as 7″ from high to low. The concrete was thin and cracking in some areas too. Here I’ve freed the old water well pump. There’s still water in the well! 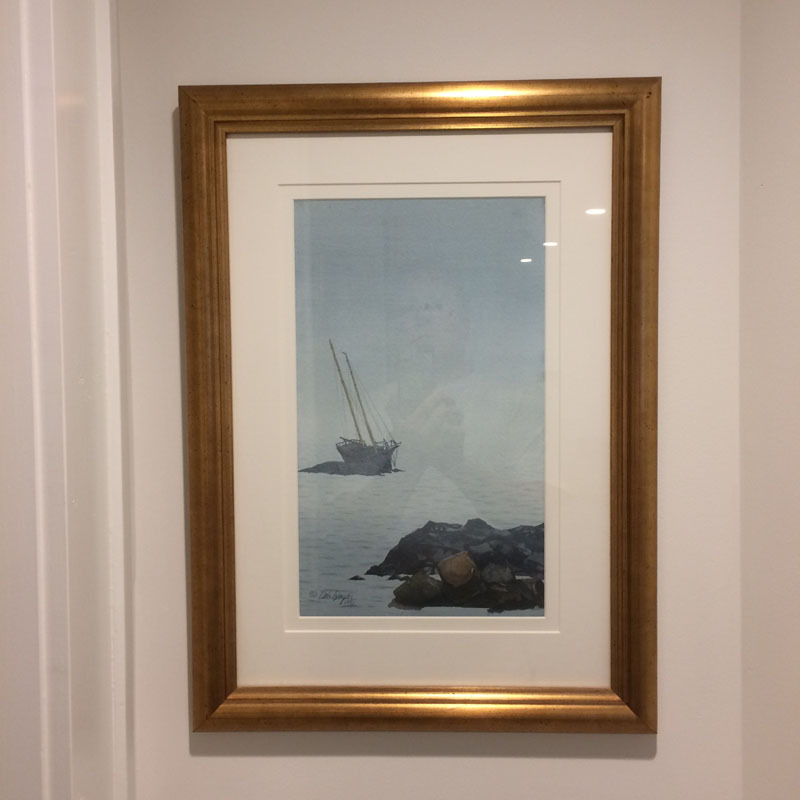 It’s 30′ down, but it’s there. I took the old pump out and wired it up, the motor ran, but the pump had seen better days. We’ll think about how to get the well working later. Here’s some nice 1930’s brick work. 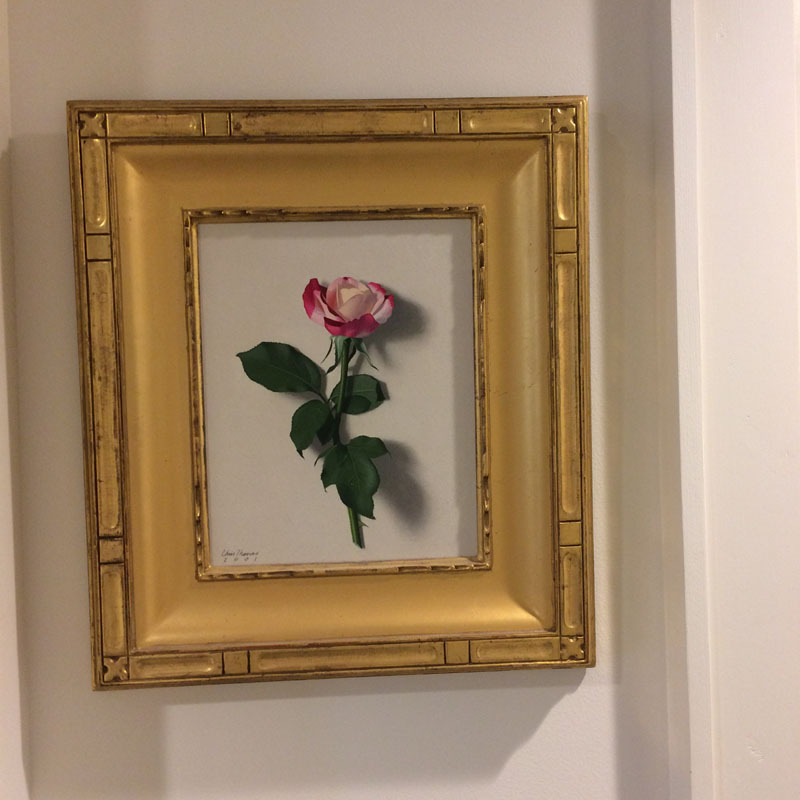 This is in the wall that bisects the basement into two rooms. 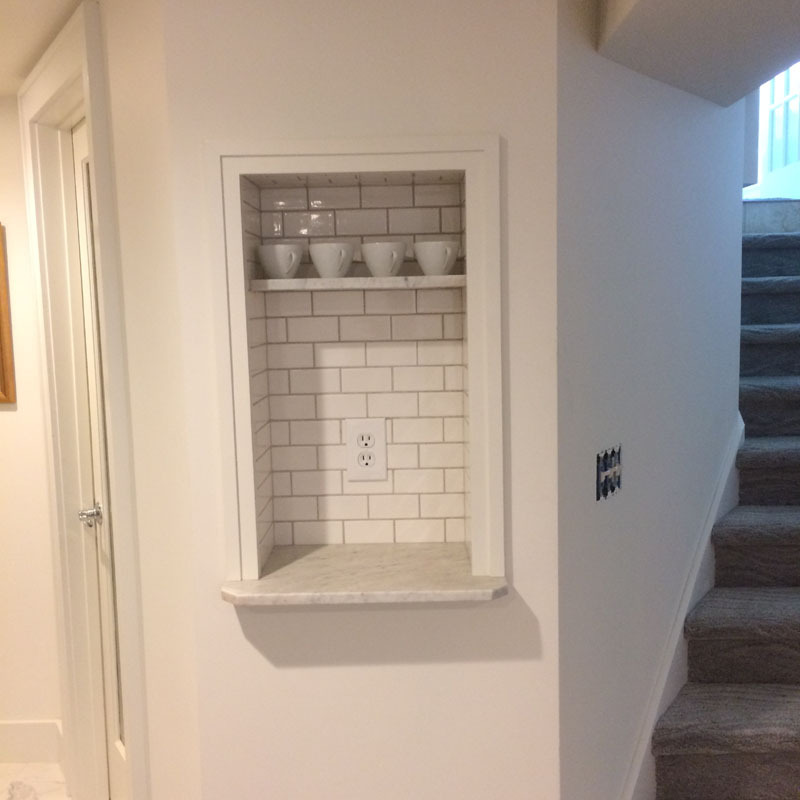 I think this was originally to be an opening into a crawl space, but they decided to put a full basement on the other side of the wall instead. Apparently there was one disgruntled worker on that job – even during the Great Depression. 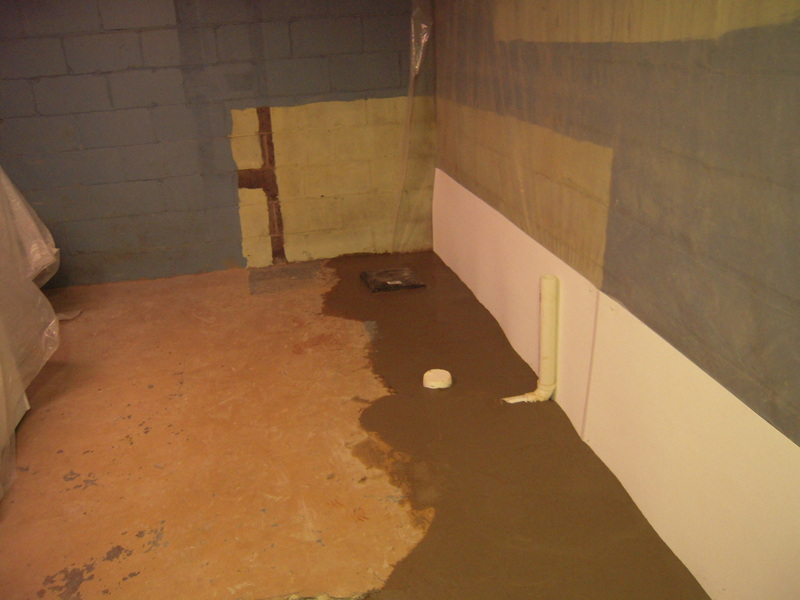 So now is the time to address the basement waterproofing. 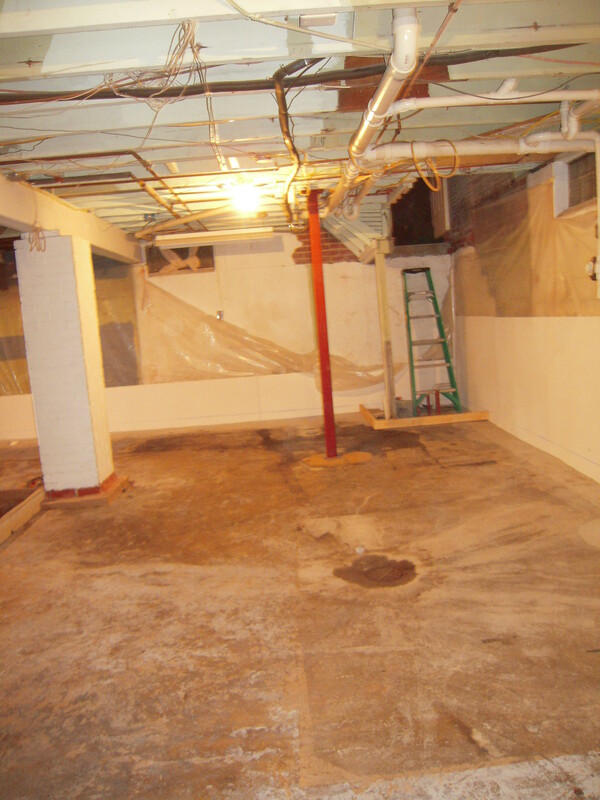 Although there was little water seepage, the future plans were to use this space as additional living space. 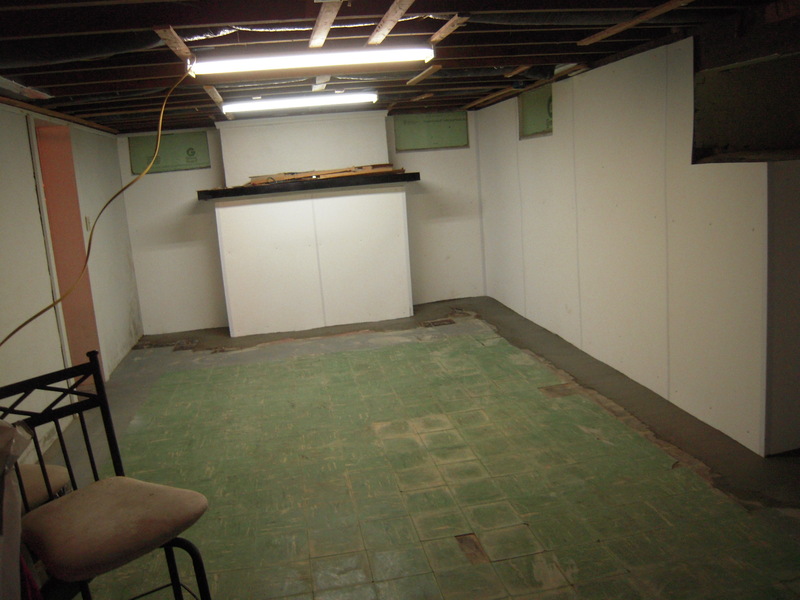 I know the best way to waterproof a basement is from the outside. That’s not really an option in this case – cost is just too much to do a proper exterior foundation drainage system. I have used the B-Dry System in 2 other 1920’s buildings with very good results. There are several other systems available. 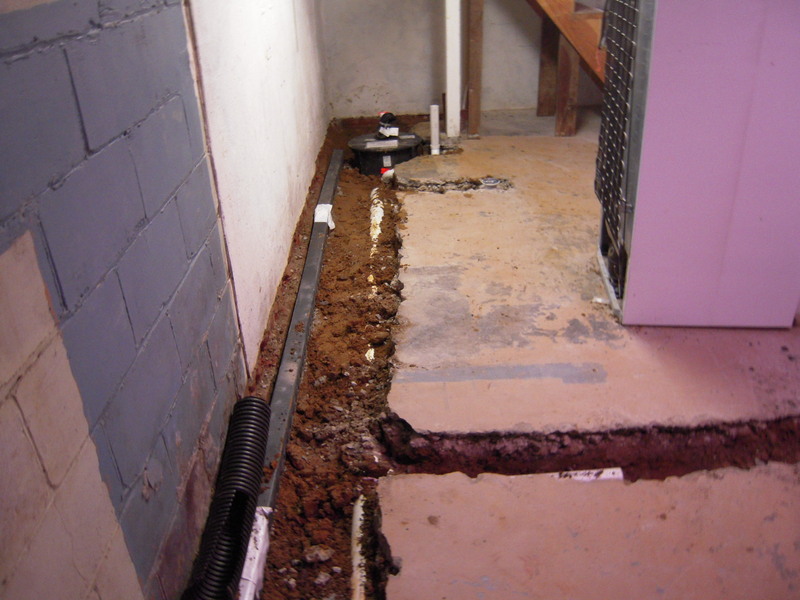 It is sometimes called a french drain system.There can be problems with these systems. They can clog over time. There are other systems on the market that have an access hatch that will allow cleaning. 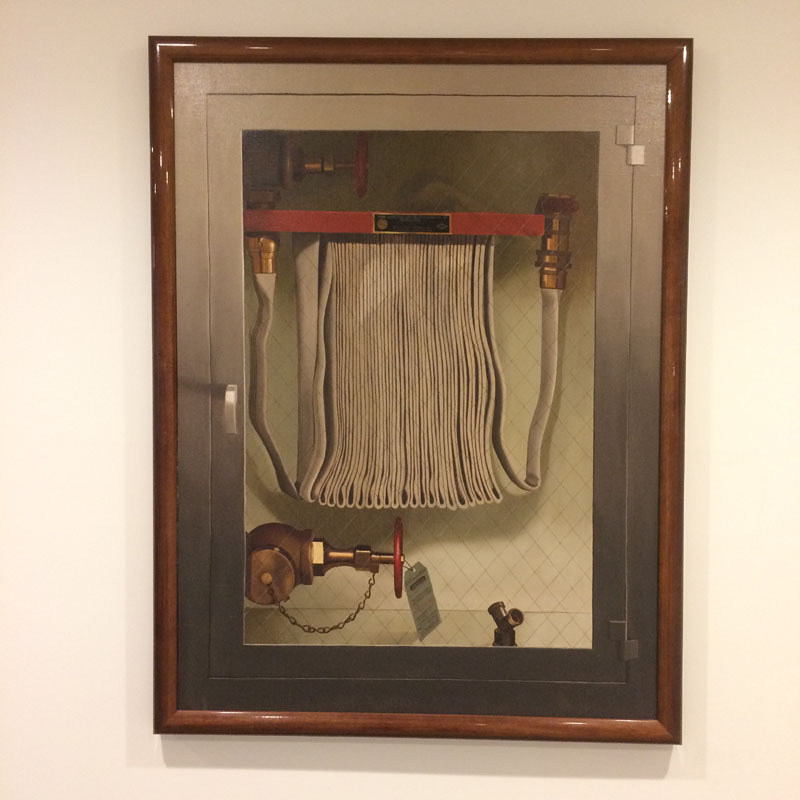 I have the B-Dry system in our gallery that was installed in 1989 and still works fine. Here is the wall that is common with the stairs. There will be waste ejector pump and a sump pump located here. 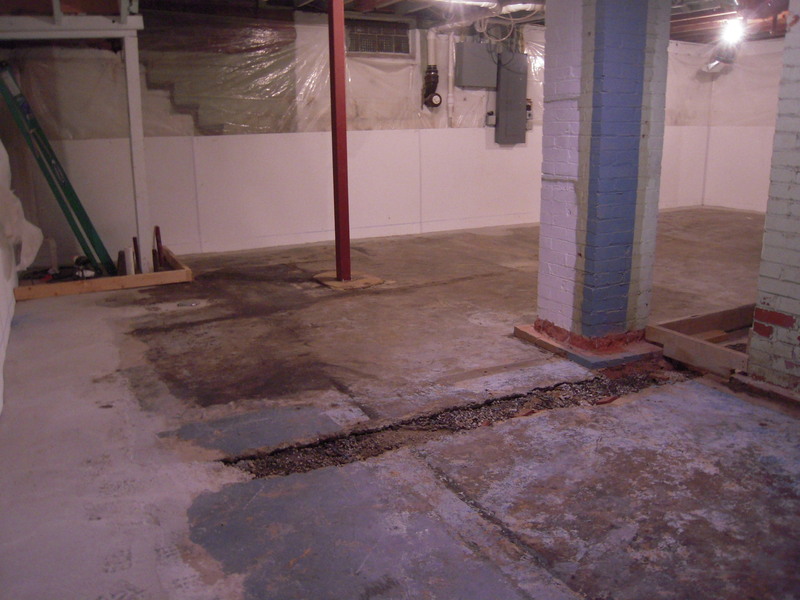 The concrete floor is broken up along the interior of the basement foundation. 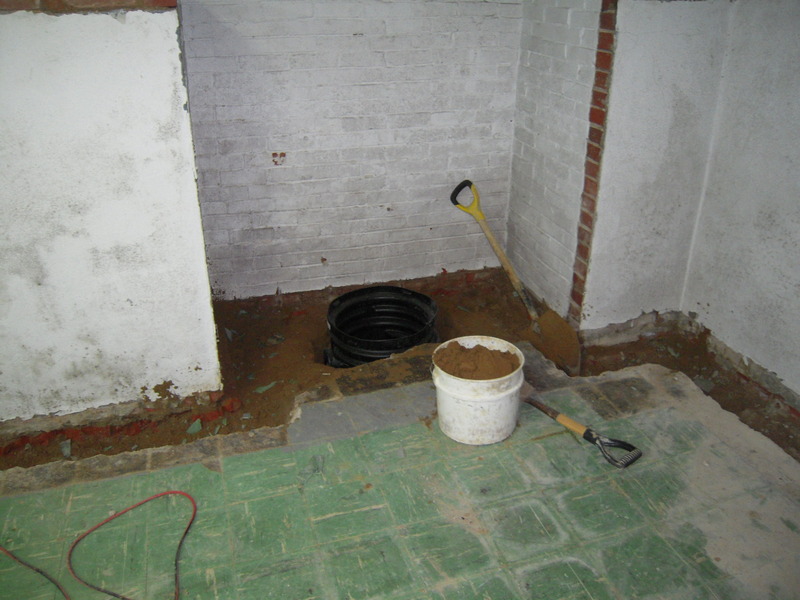 12″ of dirt is removed for the drain pipes. I also ran some additional drains for a sink, full bath and condensate drain for the air conditioner. The old sump pump being filled in. 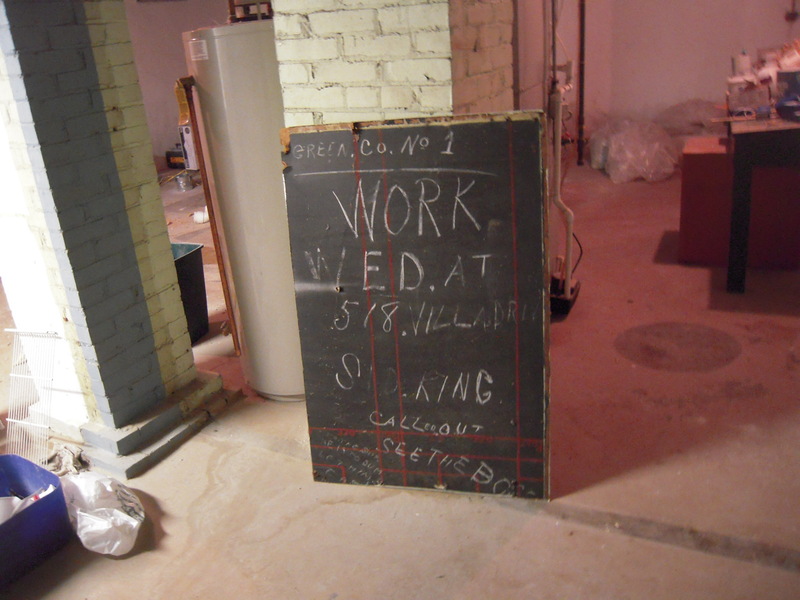 A plastic sheet is riveted to the wall. I will finish this off with a spray foam wall system later. All exterior walls were dug up and a polypropylene pipe is buried at the footer. The trench is filled with gravel before the cement is replaced. 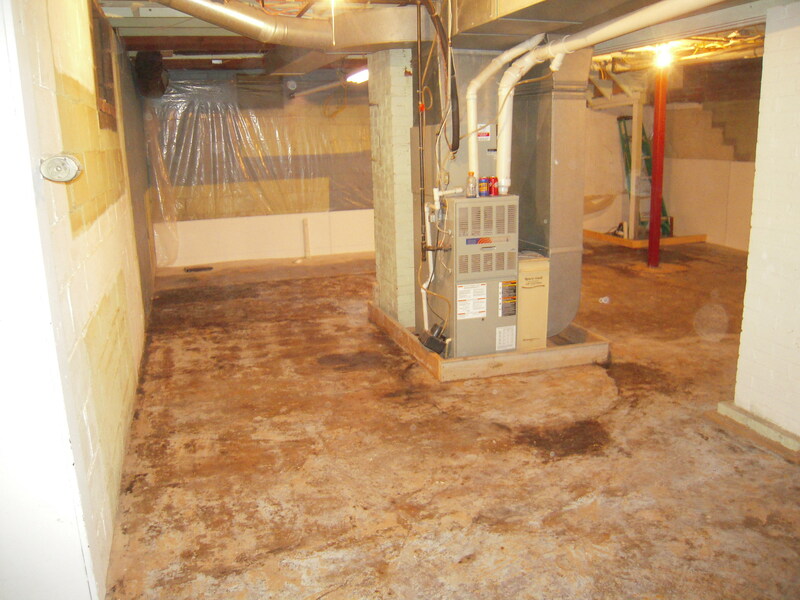 Because of the two room configuration of this basement, two sump pump systems were needed. 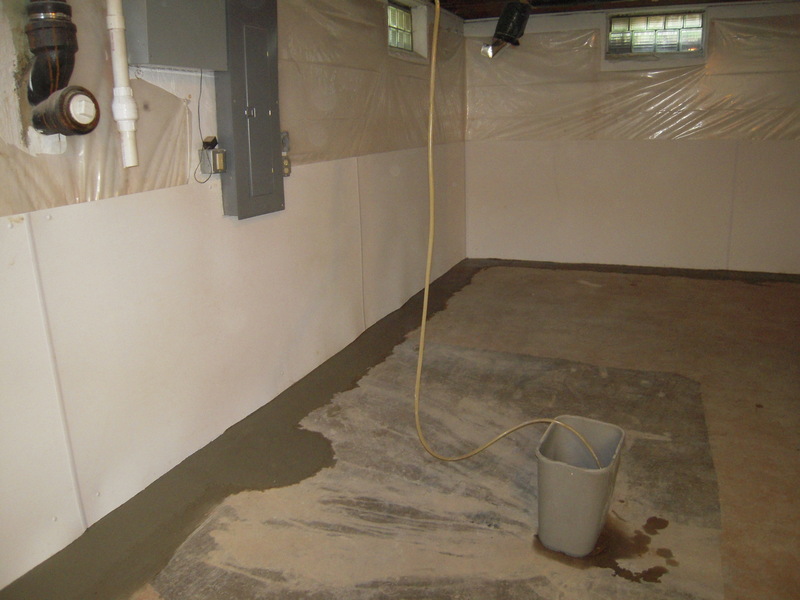 This is the second sump pump in the workroom. This is a labor intensive job. The work crew takes two days to do the job. There were 8 workers. Nope, I didn’t haul the countless 5 gallon buckets of dirt out and gravel in. I watched them do this before, and I wouldn’t DIY this job – I’m crazy, but not a masochist. The original sump pump is gone. The walls are drilled to allow water trapped in the walls to drain into the weep pipes which then drain by gravity into the sump pump. 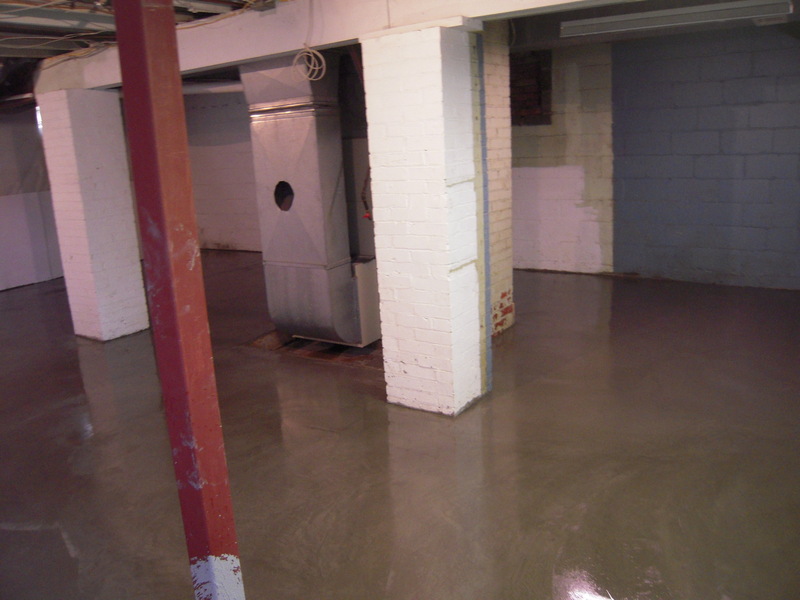 They finish the floor openings off with a high strength cement. Here is the finished floor looking back towards the stairs. 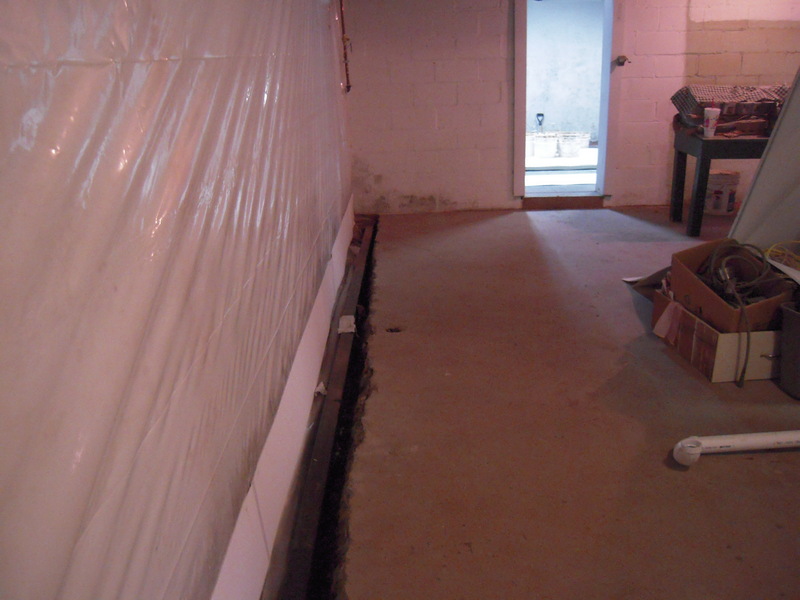 The rigid white plastic is very durable and the system does a great job keeping the basement dry. 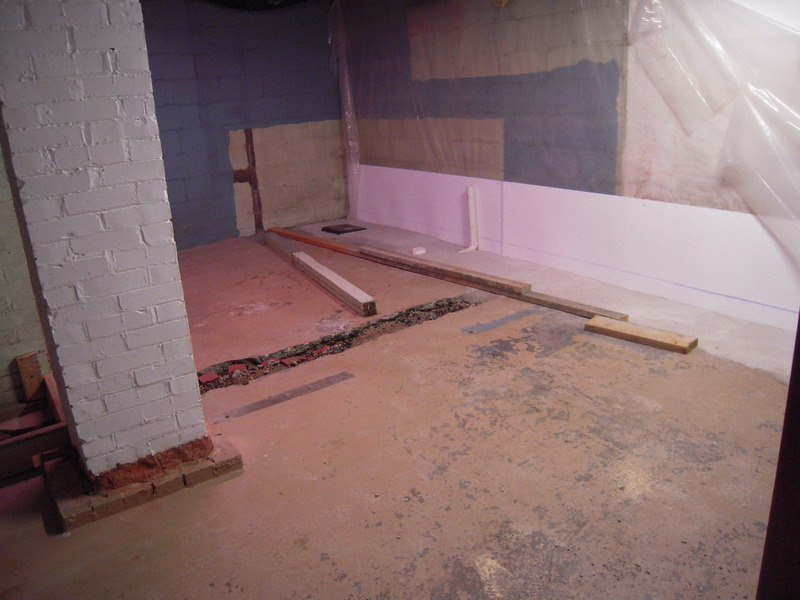 The other side of the basement that will be a workroom eventually. There was a fireplace down here originally. The living room fireplace is directly above. 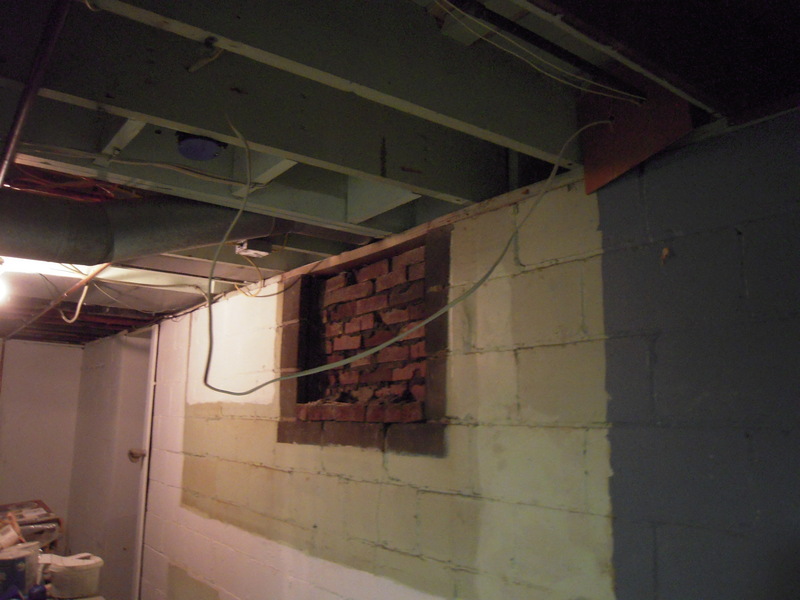 I closed this one in, as the masonry fireplace wasn’t up to code to use – and I didn’t want a fireplace in my workroom anyway. Here is the full bath rough in. These will be covered up with a new concrete floor. Yep, looks like I’m gonna make the concrete dude happy again. 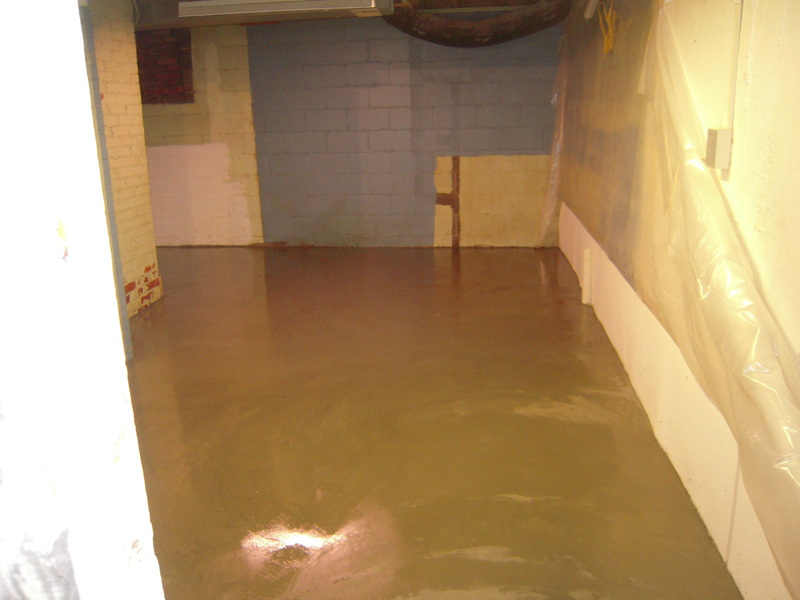 Next time – it’s pumpin’ time – not water, but concrete.